This past weekend, I went to one of my Friendly Local Gaming Stores and ran a “test” demo of Frostgrave: Ghost Archipelago. There I met with a few members of the Historical Gaming Club and got them to wet their toes into a world of fantasy. Overall, they really enjoyed the game. 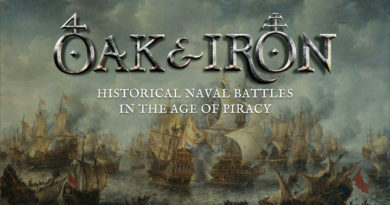 I ran this game in preparation for the Broadsword 5 Gaming Convention running this Saturday (May 5, 2018) in Hamilton, Ontario, Canada, and plan to run this game at that event. Above is the demo table I set up. One of the lessons that I learned from previous games I hosted is to not over-extend the size of the table. In previous games, I would use the full 6′ by 4′ table offered by the convention organizers. The result was a slow build up of the game. Players took too long to reach each other and too long to exit the board. Frostgrave is meant to be ran on a 3′ by 3′ table. The fix… I tied together a 12′ string and pulled that out on the table to mark a 3′ by 3′ square for the playing surface. This little technique worked perfectly and really helped to tighten up the game. 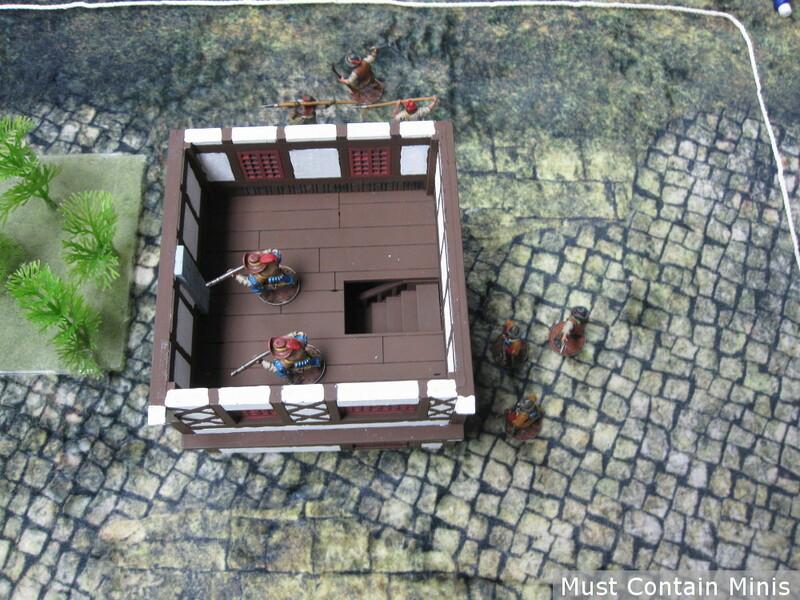 For the practice game, I allowed players to deploy their forces, but to speed up the start of the game, I will deploy the miniatures for the players at Broadsword. 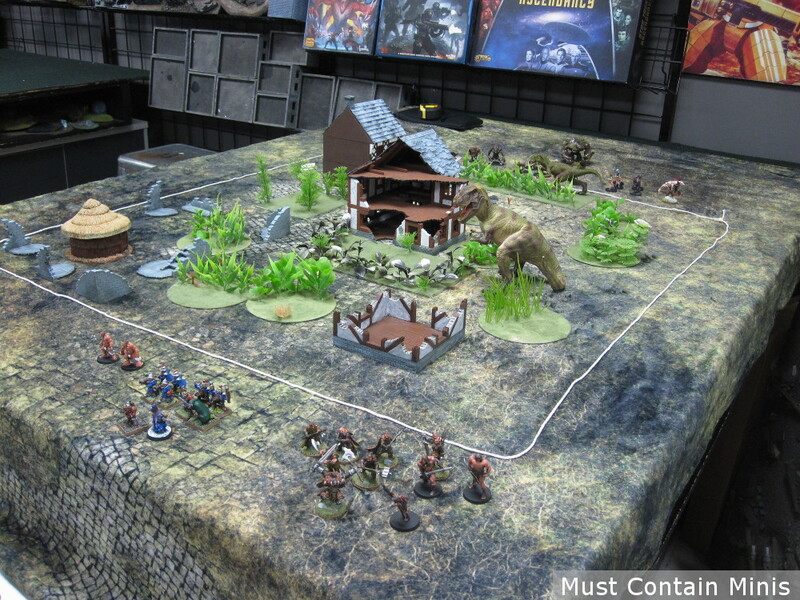 The scenery on this table includes a Jungle themed plush Cigar Box Battle Mat, four buildings by XOLK, a miniature hut by Six Squared Studios, and a bunch of scratch built jungle terrain pieces. Rather than running this game for my typical 4 to 8 players, I decided to reduce the player count down to 2 to 4 players. This should help speed up the games. For soldier profiles, I used the core rulebook and rules for Black Powder Weapons found in the first issue of Spellcaster Magazine. I themed each of the four crews differently. The Barbarian Clan focuses on Melee attack. Almost everyone in the group is armed with a heavy two-handed weapon. They deal big damage and are fast. Their Heritor has skills to deal extra damage and is the only member in the crew with a ranged attack (he can hurl large rocks at opponents). The Barbarian Warden has three spells all related to summoning animals and controlling the creatures on the board. The Barbarian Crew. Not a single ranged weapon in the whole group. The Barbarians deployed out in the open with the idea of rushing for the two closest treasures. The Dwarf Crew has four members armed with Blunderbusses (which proved super deadly in the demo) and a Heritor whose skills focus on absorbing damage and making better ranged attacks. Their Warden focuses on spells that affect plants and materials. This player had a lot of fun moving the vegetation all over the board. The Dwarf Crew. 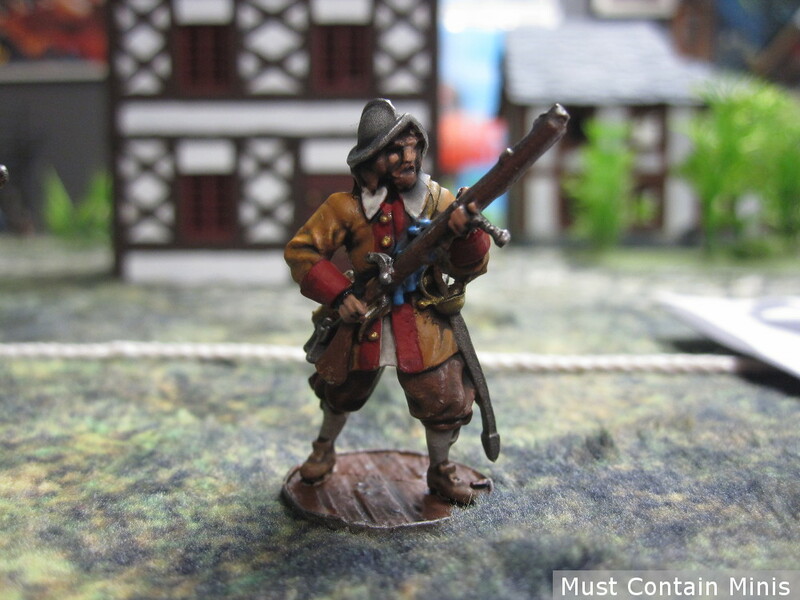 Two of the Blunderbuss armed miniatures count as just hand weapons (they ran out of bullets). Unfortunately, I did not get a deployment picture of this group. 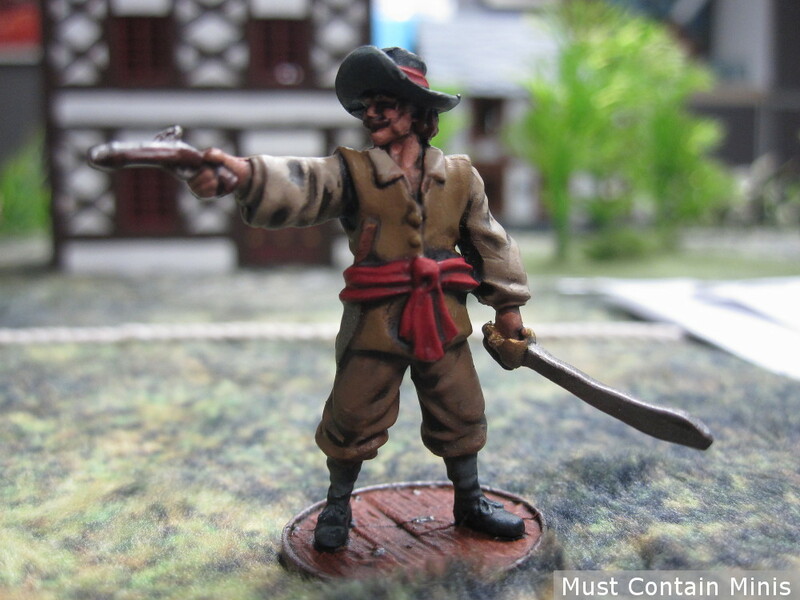 The third crew consisted entirely of Spanish Blood & Plunder miniatures by Firelock Games. These are awesome miniatures and the Spanish are actually quite a serviceable collection to use when stepping between games. This group had four crew members with muskets and four with two-handed weapons. Their Heritor is armed with a pistol and sword and has skills to evade damage in combat, shoot more accurately and to better lead his crew (gain initiative). Their Warden did not make it to the second round, but he could call down lightening and control the weather (while he was alive). This Blood & Plunder we used as the Heritor for a Demo Game of Ghost Archipelago. It worked out very well. 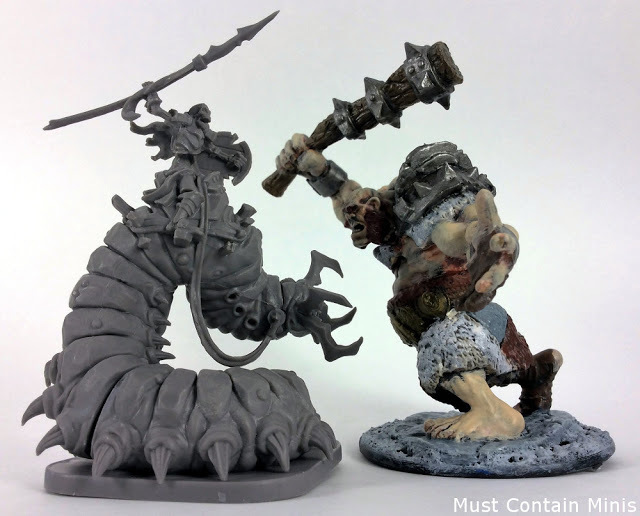 This mini was painted by Bill of Phoenix Games. A Spanish Musketeer preps his gun for battle. 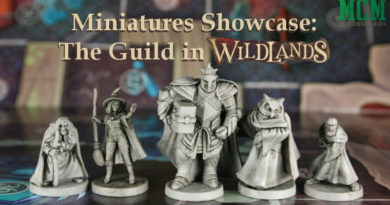 Mini painted by Bill of Phoenix Games. The Spanish started surrounding this house with two musketeers on the top floor. I did not have a fourth crew ready for the demo game, but have something in the works for Broadsword. 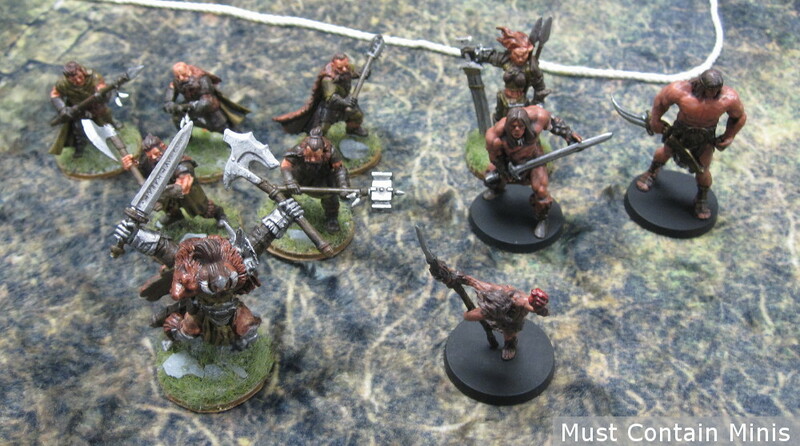 If my originally planned gang makes it, there will be a crew made entirely of miniatures from the Conan Board Game. Going a little against the grain for starting crews, I armed their Heritor with a magical two-handed sword and gave their Warden heavy armour (I know that is against the official rules, but it is to make the demo more interesting). His crew, however, does not have a single upgraded character in the whole batch. They are all standard crew members with hand weapons and nothing else. If we don’t paint that crew in time, a friend plans to bring his collection of Frostgrave Barbarians. I will differentiate the Barbarian clans by arming one with some ranged weapons and a lower concentration of two-handed weapons. This demo game went very well. Both players enjoyed themselves greatly and had no suggestions on how to improve the game. Hopefully my patrons on Saturday will find the game just as enjoyable. The number one rule of the Demo was to keep your Heritor alive. The Heritor represents you on the table – if he dies, you lose. For those that don’t know, this is a demo game rule that I made up. In the real game your Heritor could go down from his wounds and still be alive to talk about it later. Points would be determined by number of treasures carried off the table, but players would receive no points if their Heritor died. Other than a strong emphasis on keeping your Heritor alive, all the other rules I used were straight out of the rulebooks. 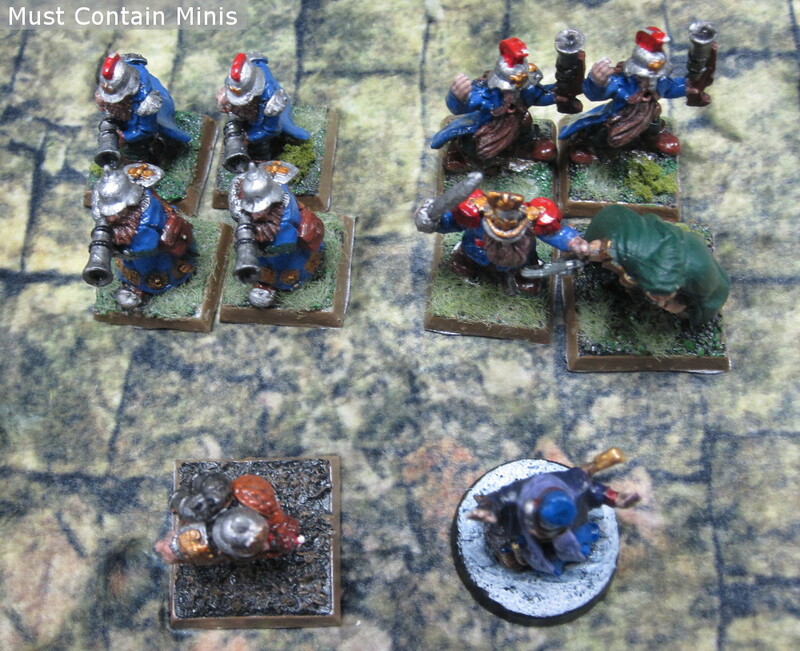 Right off the top of the game, the Dwarf player scored a critical hit on the Spanish player using a Blunderbuss. This disintegrated the Spanish crew member and a huge dinosaur heard the thunder crack of the Dwarven gun. It entered the board to search for the source of the noise. 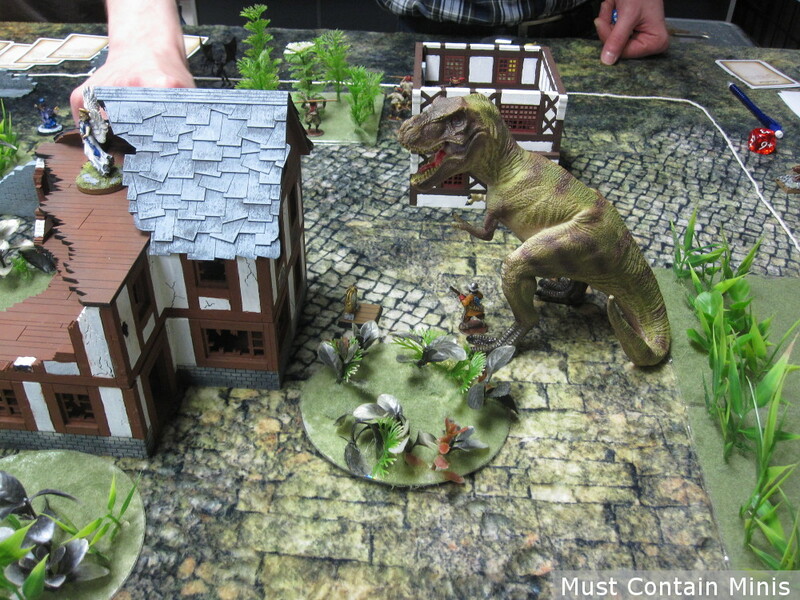 Sadly for the Spanish player, we rolled his side of the board as the entry point for the dinosaur. By turn two, this beast threatened the Spanish Heritor and two of his crew members. 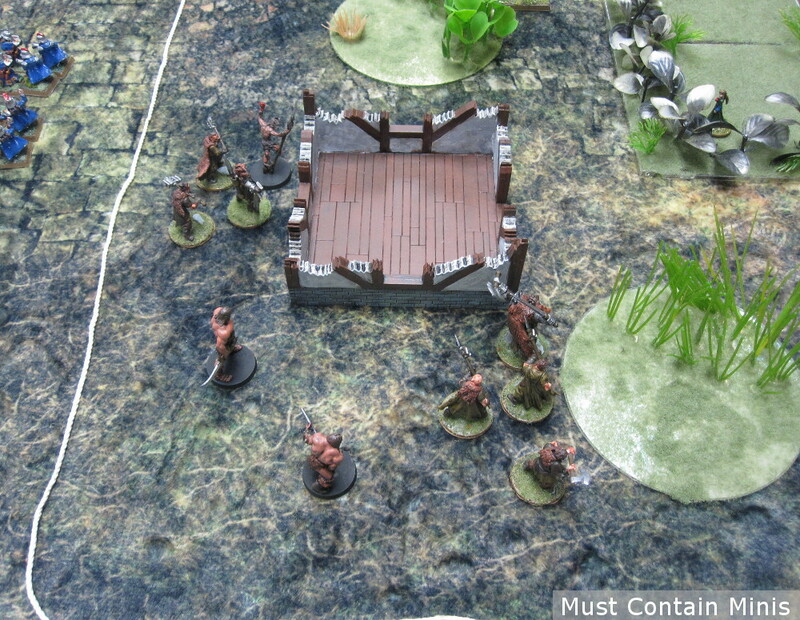 A musketeer stayed behind to keep the monster at bay while the Heritor ran for the most valuable treasure on the board. 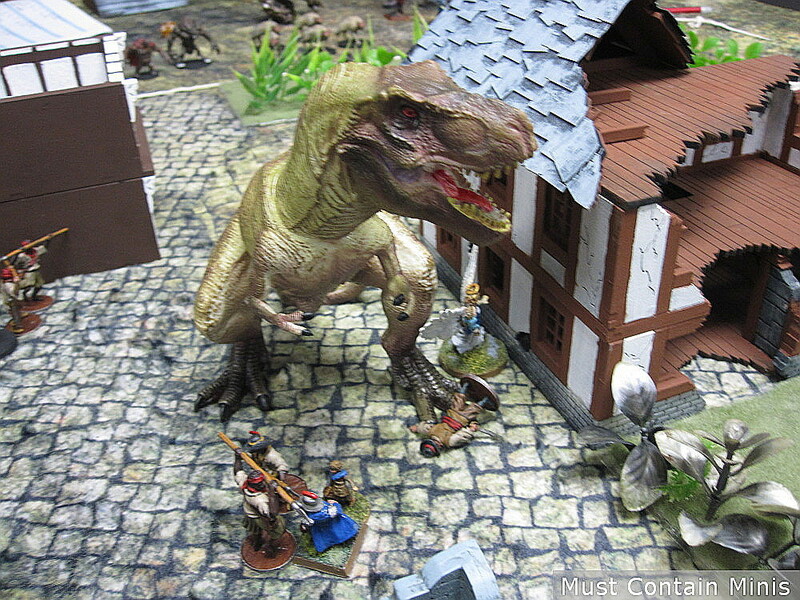 A lone Spanish Musketman acts as a speedbump in trying to save his boss from a terrible dinosaur. Surprisingly, the musketeer lasted two turns before meeting his demise. 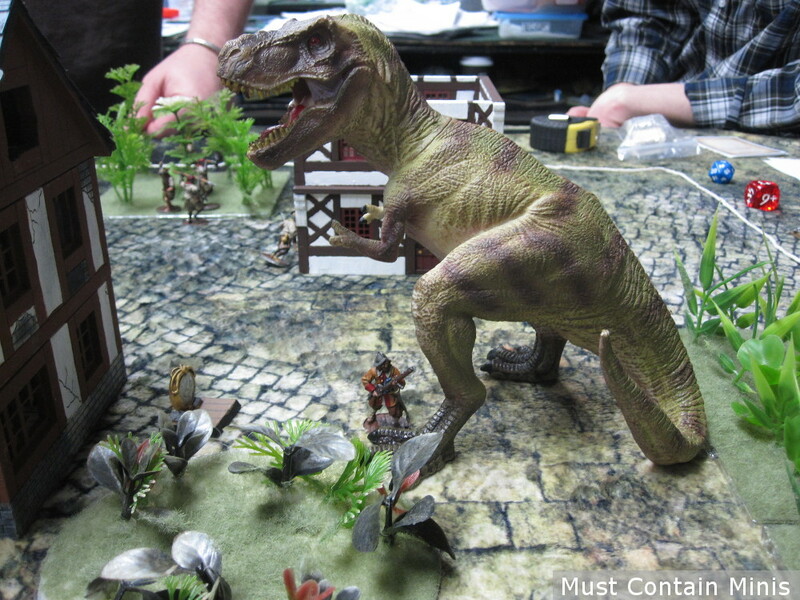 After the death of that poor musketman, the Barbarian Beast Warden took control of the Giant Dinosaur (for just one movement round) and placed it closer to the Spanish Heritor. The Poor Heritor would soon meet his end from this terrible creature. The Spanish Heritor meets an end under the foot of this giant beast. Notice that beside him is the most valuable treasure on the board – a Guardian Angel. Apparently, that angel did not work out too well for the Spanish leader. I do apologize for the quality of this photo. It came in blurry and I over enhanced it to counterbalance the soft focus. Shortly later, the Barbarian Heritor also met his death. His end came at the hands of the Dwarf Heritor, whom struck him with a perfectly aimed crossbow shot straight through several plants and a window opening of the ruined house and straight through the Barbarian’s heart. For the Dwarf, this win was spectacular! Not so much for the Barbarian player. At this point, only the Dwarf’s crew remained. To win, he just needed to exit the board safely. Sadly for him, a random beast was rolled to enter right where the Heritor had hoped to leave. An Ape quickly charged the Heritor and hit him with a critical hit that should have killed him outright. Lucky for the Heritor Osprey Games changed the rules to Critical Strikes in Frostgrave: Ghost Archipelago. The hit should still have killed the Heritor, but thanks to the Heritor’s special abilities, he managed to survive the savage attack! In the end, the Dwarfs carried off just one treasure and had the only remaining alive Heritor – making them the winner by default. Will the participation game on Saturday run the same? We will find out!!! 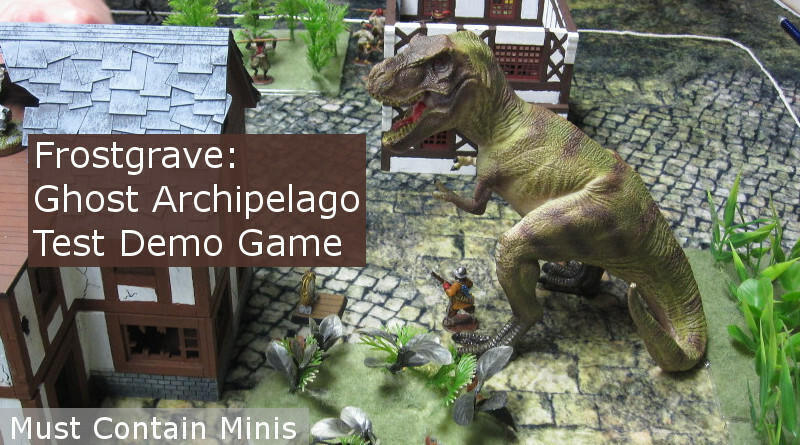 For the actual Frostgrave: Ghost Archipelago Demo, I plan run two shorter rounds with the same players so that players get a sense of leveling up their characters between missions. I find that it is what you do between the games that helps give Frostgrave its charm and appeal. A quick view of the Frostgrave: Ghost Archipelago table. It is going to be a lot of fun to run this demo again!